Chiropractic was a natural fit for me to incorporate my love of working with people and helping to educate them on what it means to be and stay healthy. 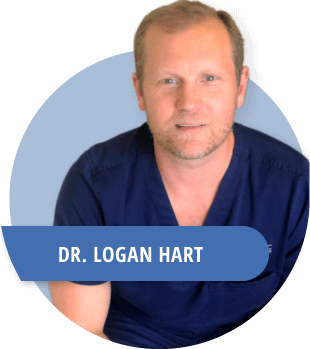 With a lifelong passion for healthy living and helping others, chiropractic was a natural fit for Dr. Logan Hart. He earned his Bachelor of Science degree from North Carolina State University in Raleigh, NC, before moving onto Life University in Marietta, GA for chiropractic college. There, he chose to pursue both a Master of Science and a Doctorate in Chiropractic. While in school, he was able to provide chiropractic care to collegiate athletes, tennis players, golfers and triathletes. Dr. Hart also pursues his passions through charitable work with the National Parkinson’s Foundation, the American Heart Association, and the Ovarian Cancer Research Fund. Dr. Hart hails from High Point, NC, and when he’s not seeing patients, he enjoys spending time with his family and his friends, including his beloved blue pit-lab mix, Clyde. He also loves to fish and stay active, and is a sports fanatic.